Today was one of those great Saturdays that involves a courier turning up with a box of goodness - my order from Battlescene Designs had arrived. 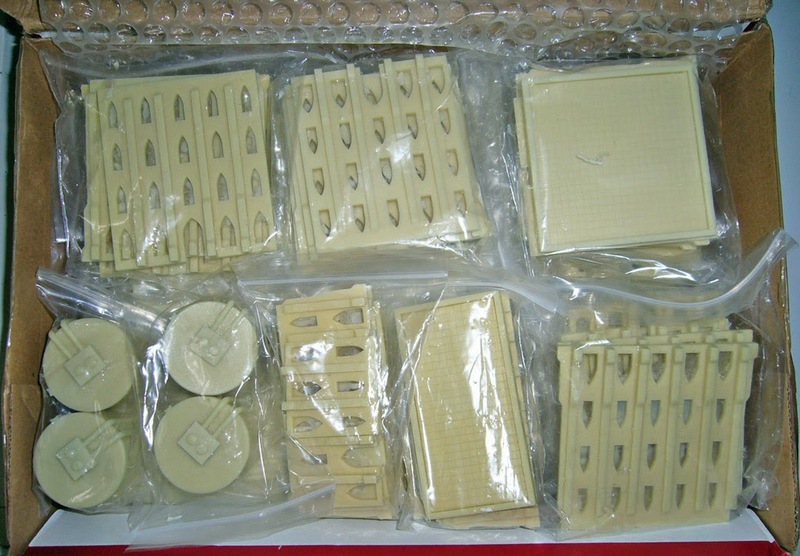 As far as I'm aware, Battlescene Designs is another of those one man companies that has sprung up making specialist wargames stuff which has previously been difficult to find. What many of us 6mm sci-fi players have been after is generic gothic style buildings, and Battlescene delivers the goods! Here's a look at the top layer of the parcel. First impressions are favourable. The castings are nice and clean with flash mainly fine and easy to clear material in the windows. None of the industrial strength filing that some kits I've bought from other companies in the past required! First items are these generic Fuel Silos. Nothing flashy about these but they don't need to be. 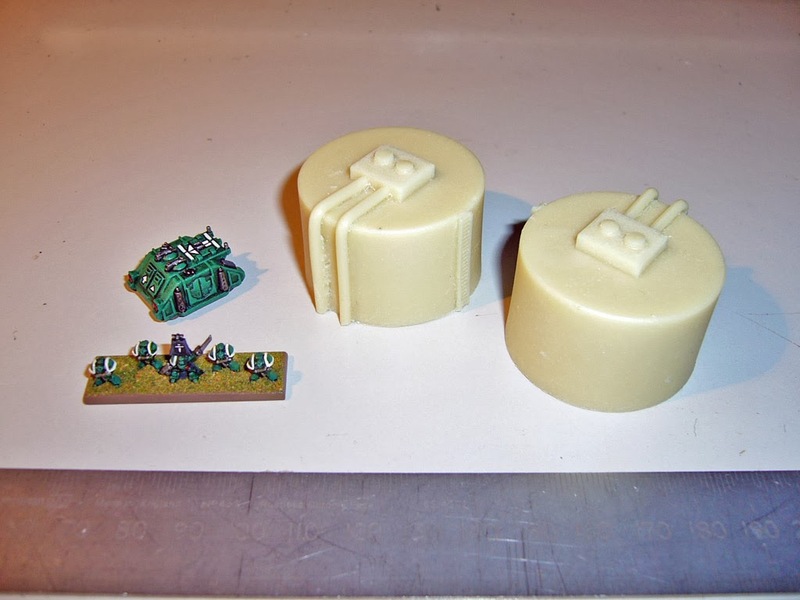 6mm Space Marines and Rhino APC to give size comparison. Wasn't really after these but decided to get 4 of them anyway as they will add a bit of variety and are nice pieces. Next here is the Hangar/Barracks/Workshop building. This is a solid piece and thus quite heavy. 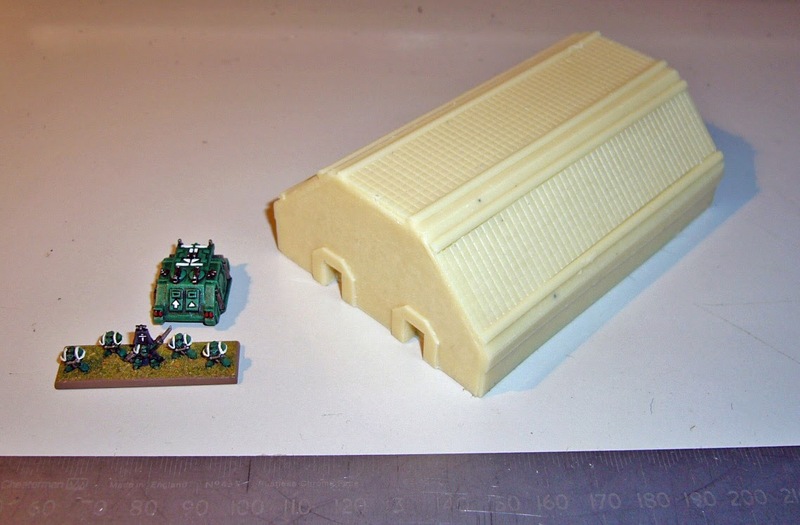 I don't know about a hangar with my miniatures given the size of the main door, but it certainly works well as a barracks or light vehicle shed for the scale. For 3mm sci-fi it would definitely make a great hangar. Here's the other end of it which has a couple of small doors. 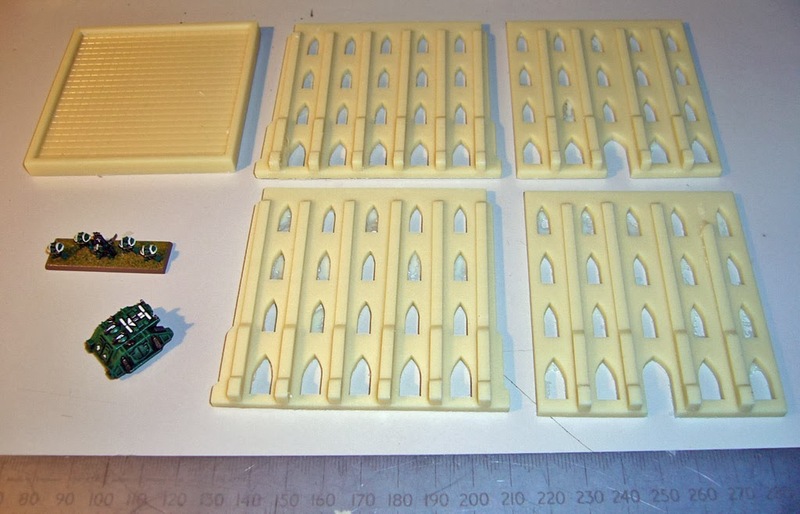 And now for the stuff I was really after, 6mm scale gothic style buildings! First is the Small Gothic Admin Building. These come in sections which means you can easily smash them up and make ruins if you want. I won't be doing that with mine but it is a great idea. The other really fantastic thing about this design is that it means substantial savings on weight (and cost!). I will be adding card sheets to the inside to cover up the windows, but this design also means you could use some sheets of coloured perspex or similar to create some cool effects if you wanted to I suppose. Here's one I stuck together temporarily with Blu-Tack to show it assembled. Interior of roof section (inside the rim) is just over 80x40mm. 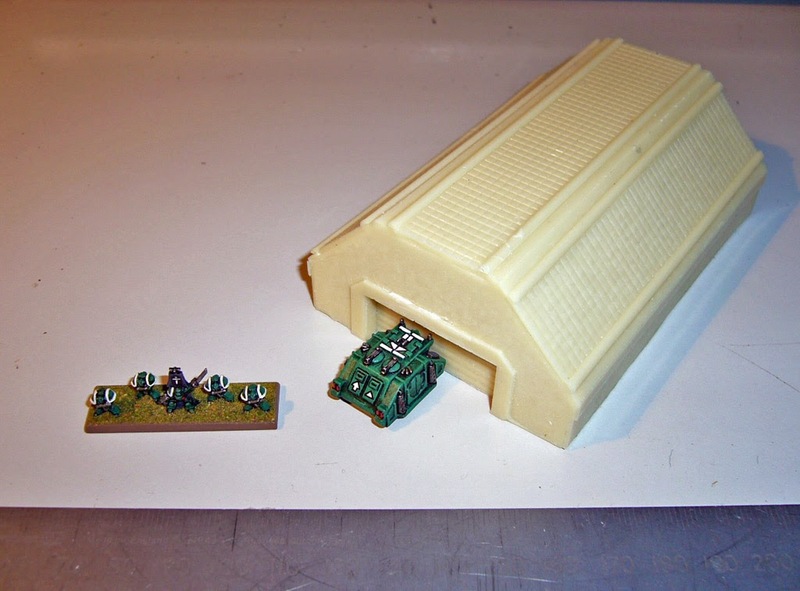 The size means 40mm bases can defend it in any direction. Here is the Large Gothic Admin Building. Once again it comes in pieces as above. Assembled with Blu-Tack. Length of roof inside the rim are is about 68mm in each direction. Here's the previous buildings shown together for size comparison. 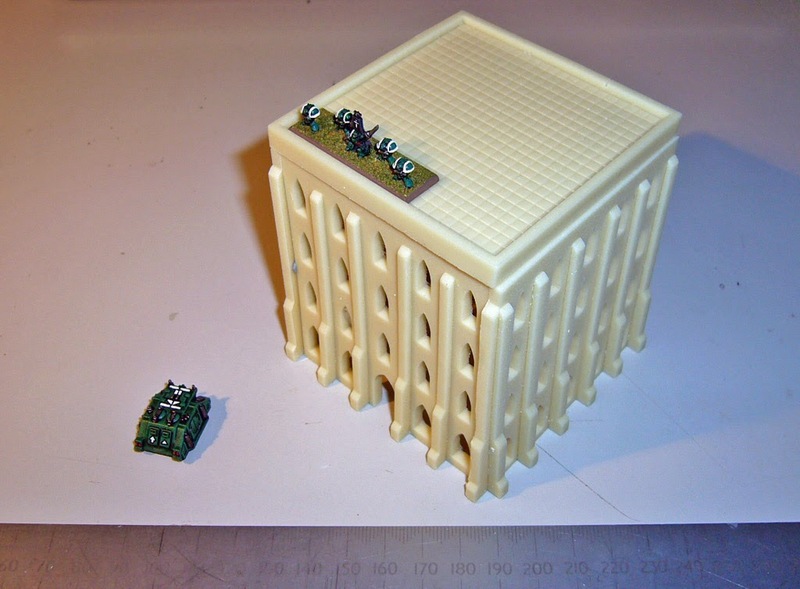 I ordered 8 of the large admin buildings, 4 of the small admin buildings, 2 Barracks and 4 Fuel Silos. So overall I'm very happy with these pieces, and extremely happy with the price! 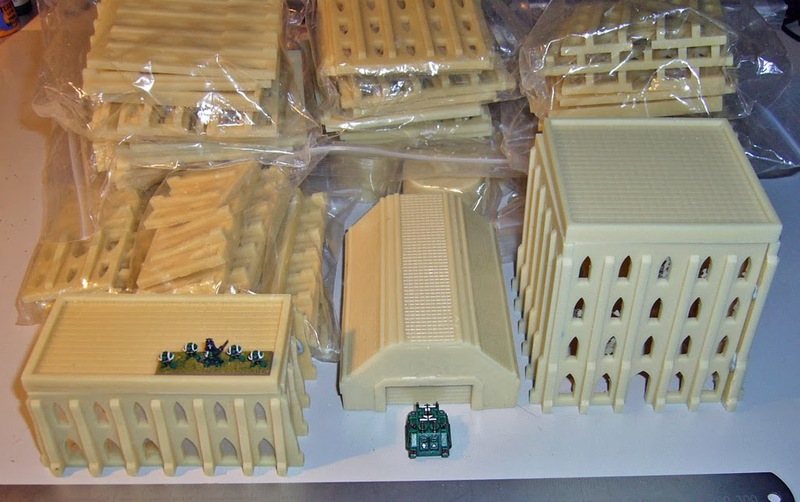 At 3 pounds for the small gothic building and 3.5 pounds for the large gothic building, this has to be the cheapest way to get impressive looking scenery for a Gothic style cityscape. Other customers must have had the same thought, as I see these items are all out of stock at present! I believe Paul from Battlescene is aiming to have them back in stock in February. 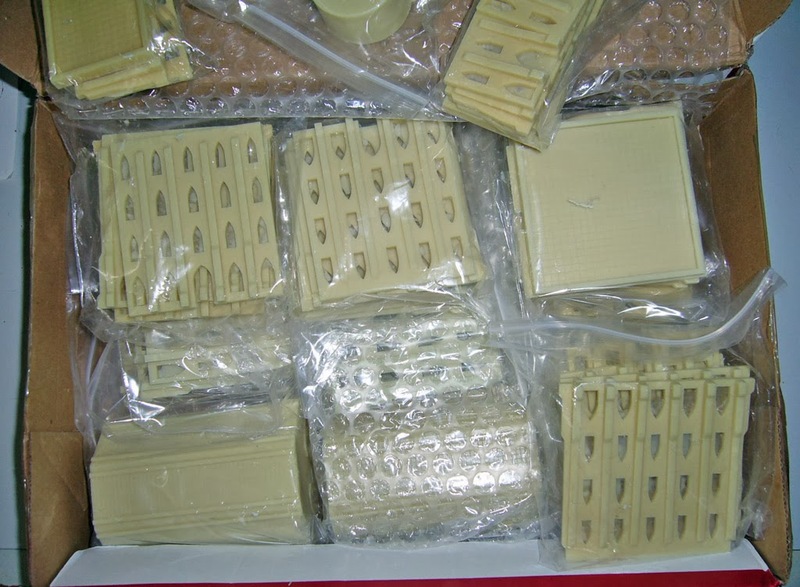 In the meantime a range of Airfield Pieces has also been released, including landing pads and a control tower. 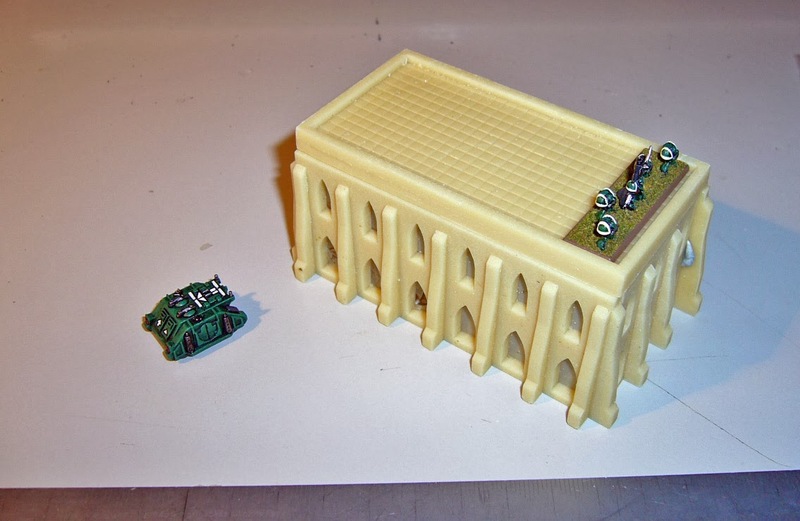 At about the same time I became aware of these buildings, Exodus Wars Miniatures released 6mm scale plastic Gothic Building sprues, though these appear to be more expensive for what you get. 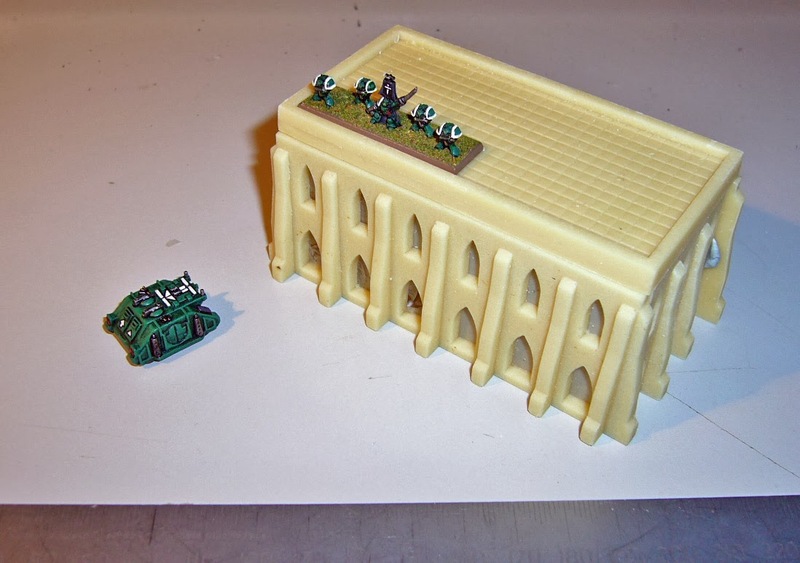 Possibly about 30% more expensive than Battlescene and that's not including the fact that the Exodus Wars buildings don't come with roof sections. 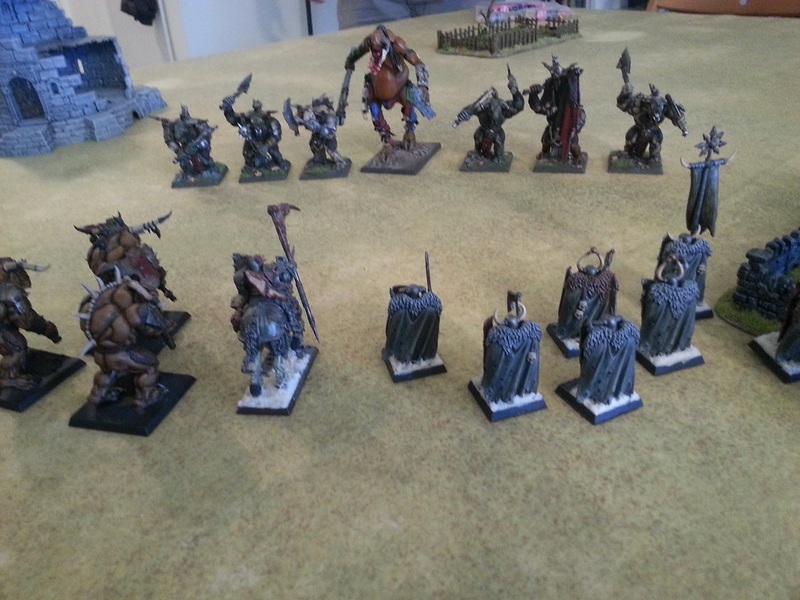 Free shipping deals from Exodus Wars on large orders will reduce that difference somewhat, but shipping charges from Battlescene to New Zealand were also very reasonable. I will still buy a few of the Exodus Wars buildings to compare them, and mixing up buildings from the two companies will add some further variety. 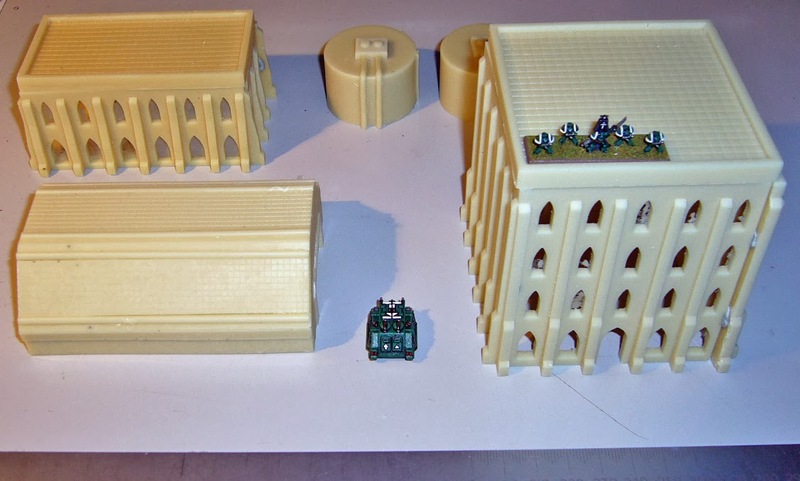 However if you wish to build a substantial cityscape as I am planning to do, then these Battlescene Designs buildings appear to offer the most economical option at present. Yeah thought you might like them! Nice review for good looking scenery. Would have been a very cheap alternative if I had not already started with the original epic 40k ruins... Anyway i am going to link this post on my blog as well if you don´t mind. Thanks! And sure link away!